Handcrafted and Made in the USA from premium Birchwood—this is a wooden puzzle that even non-puzzlers can get behind. 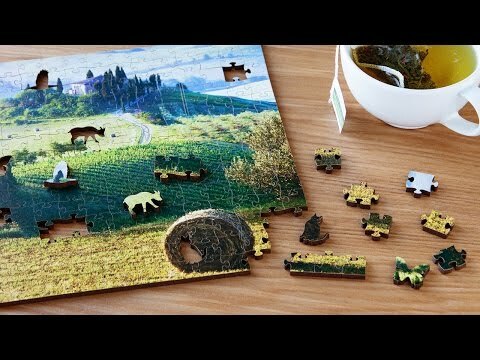 Zen Art & Design has 300 glossy, photo-real, Giclee-coated jigsaw pieces that have a heirloom look and a substantial tactile feel. Non-traditionally shaped pieces (like dogs and human silhouettes) are part of the picture, too, to make constructing the final image all the more captivating. Log your puzzle time in the included book and look back on others’ entries. It will be entertaining your family for generations. Dimensions: 11.5" x 11.5" x 0.19"
I love these puzzles. They are challenging and beautiful! 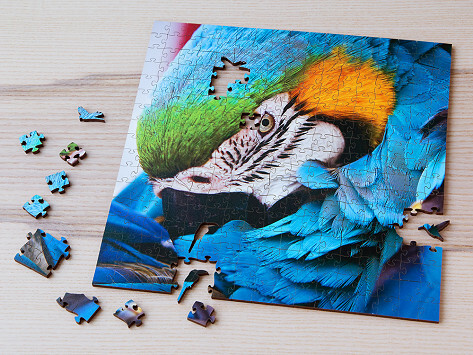 These puzzles are ones both puzzle enthusiasts and “non-puzzle people” can get behind.